We had the most amazing boondocking experience the other day at Hagen’s Cove, which is part of the Big Bend Wildlife Refuge located in the panhandle region of Florida. After our previous experience parking overnight at a municipal parking lot in Panama City (click here to read about it), it was such a pleasure to discover what boondocking is like when you’re camped out in the great outdoors. There wasn’t any cunning plan to go boondocking at Hagen’s Cove. It was one of those places we just stumbled upon. They’re often the best kind. We saw a dirt road, turned down it and ended up in a little slice of paradise. I imagine Hagen’s Cove is a popular place for birders and picnickers. Part of the Florida Birding Trail runs through the area. We tried walking down one of the trails, but it was pretty swampy due to the recent rains. So we turned back – I’m not a big fan of wet feet. We were never 100% sure if it was okay to boondock at Haven’s Cove. We didn’t see any signs that said the refuge was closed after sunset or notices prohibiting overnight parking/camping. We looked online to see if we could find anything out about camping there, but drew a blank. A Sherriff's car made a circuit of Hagen’s Cove a couple of times checking to make sure there weren’t any kids getting up to mischief. Scott stopped the deputy and asked her if she knew if it was okay to stay overnight. She said she wasn’t sure if you could. She personally wouldn’t toss us out, but couldn’t vouch for whoever was on duty at night and what stance they might take. We decided to chance it. Fortunately, no one knocked on the door in the middle of the night to roust us out. Sometimes you just have to take a chance – most of the time it pays off. Like this time. Which meant we got to enjoy our coffee on the observation tower while watching the birds scampering about in the water the next morning. The horizon and the water were the exact same color. It was hard to tell where one began and the other left off. While a few people drove down to Hagen’s Cove, the only people that stuck around were duck hunters. Sadly, they didn’t have any luck. We were hoping for a handout of duck meat to put on the grill. But, I imagine the duck hunters were more disappointed than us, given that they had come from Georgia to hunt there. 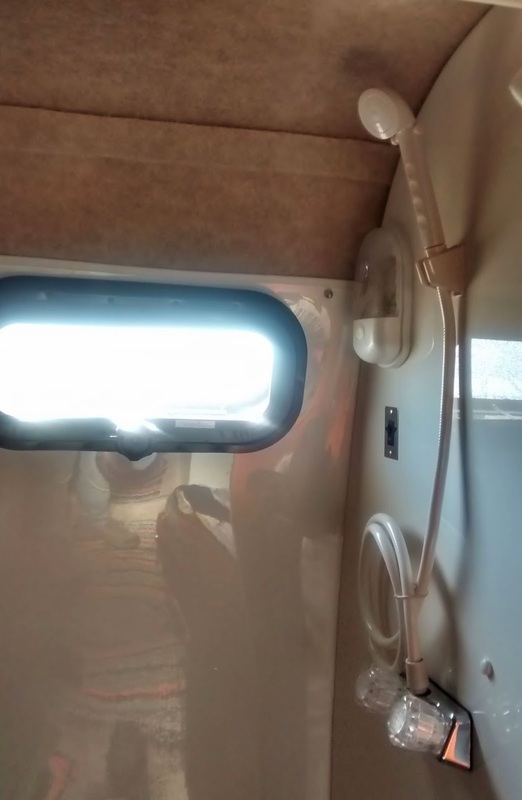 If you aren’t familiar with the term boondocking, it is basically dry camping (i.e., no water, electric, sewage connections). Lots of folks boondock for days, if not weeks, at a time. Some have systems in place to provide power (e.g., solar or generators), while others do without anything that requires electricity. Whether you need power or not, everyone needs a water supply and a way to store their gray water (from dishwashing, showers etc) and do something with their black water (basically sewage). We have pretty small tanks in our Scamp travel trailer, so we’re pretty limited by how long we can stay out. But with our experience living on a small sailboat, we’ve learned a few tricks to make our water supply last and live with limited power. Hopefully, we’ll get some more boondocking opportunities, like our time at Hagen’s Cove, to put them to the test. What’s been your favorite boondocking experience? Want To Follow Scamper & Us? If you're interested in following along with our adventures with Scamper, you can like us on Facebook, follow us via Google+ or add us to your Bloglovin' or Feedly feeds. We're also on Pinterest and Instagram. You can also sign up to get our posts via email - just submit your email address in the box on the right hand side of our blog page. We would love to hear what you think - so please leave us a comment below or feel free to email us! 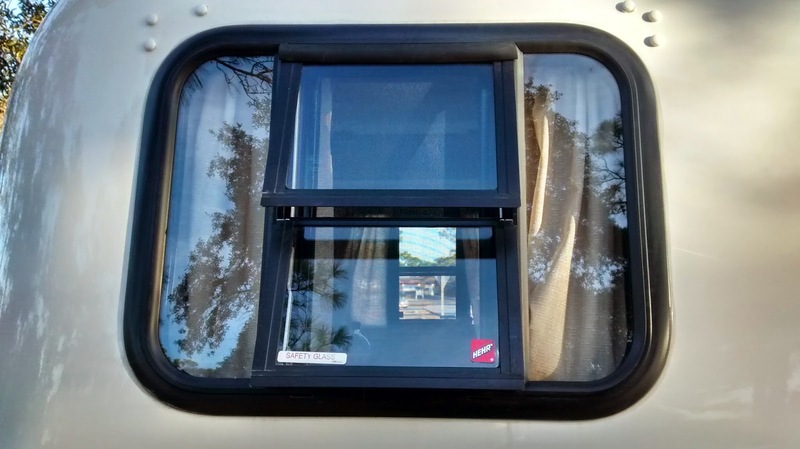 We took our chances boondocking at Hagen's Cove on 24 January 2015. A guy that we talked to at the David Bayou unit of the Gulf Islands National Seashore in Mississippi suggested that we check out the Fort Pickens unit in Florida. 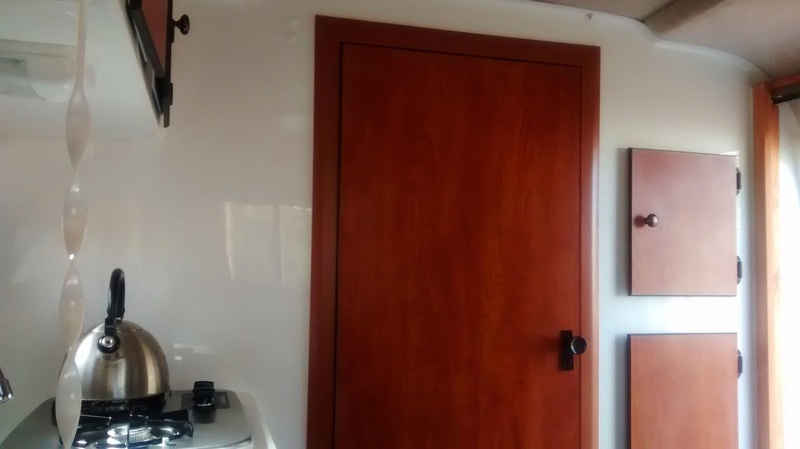 He owns a Casita travel trailer (a sort of cousin to the Scamp travel trailers), so we figured we should check it out as anyone who owns a Casita or Scamp has to know what they’re taking about. There’s Scamper parked up at the Fort Pickens campground ($26 a night with water and electric). We had a heck of a time getting settled into a campsite, but that’s a story for another day. You can probably tell from the name that Fort Pickens has something to do with forts. We started off our walk at Battery Worth. Great views from the top. Then we headed up the path to the main attraction – Fort Pickens. The fort was built between 1829-1834 to defend Pensacola Bay and its navy yard from foreign invaders. The foreign invasion never happened and the only real action the fort saw was during the Civil War. When I first saw it, the arches reminded me of some of the Roman sites we’ve seen in Europe and Tunisia. Until you see the cannon on top, then you remember that this isn’t a Roman site after all. The American flag and the fact that you can hear them playing taps and reveille at the nearby Naval base in Pensacola also gives it away. Completely unrelated to Fort Pickens, but do you remember seeing Officer and a Gentleman with Richard Gere. I kept thinking about that movie the entire time we were at Fort Pickens as the fighter jets kept flying overhead. We poked around the fort on a self-guided tour. We started off with me reading out loud from the pamphlet as we went along, but that got old fast, so Scott got his own and we read quietly to ourselves instead. I don’t think I could be a tour guide. Fort Pickens was pretty interesting from an architectural standpoint and, if you’re into American military history, then you’ll love it. Personally, I sometimes get a little bored when there is too much talk about battles, armaments, troop deployments etc. Just ask my American History teacher. My grades weren’t stellar, to say the least. So for me, the beach was the real attraction of our time at Fort Pickens. And there it was - just a hop, skip and a jump from our campground. I love boardwalks. No idea why, but they’re so much fun to walk on. As we headed down to the beach, we saw a woman poking her walking stick into the sand. Scott thought she might have been tormenting some sea turtles. I thought she was probably writing something in the sand. I guess you can tell which one of us is the cynical one in this relationship. I was right! She was drawing a cute little heart. Isn’t it adorable? I think I saw Scott roll his eyes a little bit when I took this picture. As we walked along the beach, I saw what looked like burrows in the sand. I asked Scott what kind of animal he thought made them. He laughed. Turns out they’re just marks from walking poles. Not burrows from some strange sea creature. Sometimes, I’m not the sharpest implement in the toolbox. Imaginative – yes, sharp – not always. We ended up following these walking stick marks along the beach. I think they’re from the lady who made the heart. Along the way, we saw all of these cairns made out of feathers. It’s the kind of place that inspires people to do silly things – like create hearts and feather cairns. Or try to remember what you learned in that ballroom dancing class you took in Scotland many years ago. We might of looked stupid, but we had fun and laughed a lot. And the perfect end to any day at Fort Pickens – just look at that sunset. Of course, our retinas will never be the same after looking at the sun as it was setting, but sometimes you have to pay a price to enjoy the beauty of nature. Even if that means forsaking your eyesight. 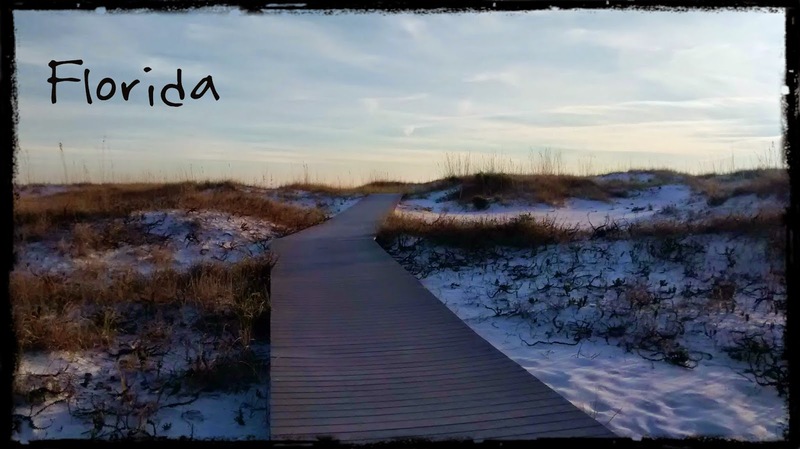 We soaked up the sunshine at Fort Pickens, Gulf Island National Seashore on 15-18 January 2015. When you’re a cheap and cheerful traveler and looking to make your pennies stretch as far as they can, then there is nothing better than getting something for free. And that’s where boondocking comes in. After all, what could be better than a free campsite? You can find some amazing places to camp for free in the great outdoors or you can find some not so amazing places to camp for free in town. Since we got Scamper (our 13’ Scamp travel trailer), we’ve stayed at Walmart overnight a few times. It’s about what you would expect – it’s a parking lot. Bright street lights, vehicles pulling in and out and the only greenery around are some straggly weeds poking through cracks in the pavement. But, what the heck it’s free. And if you run out of milk for your morning coffee, it’s a pretty hand place to be parked. And trust me, a morning without coffee in our Scamper isn’t a pretty sight. People get a little cranky when there’s no coffee to be had. The other day, we had our first non-Walmart boondocking experience in Scamper. We found ourselves a parking lot that allows overnight parking in the historic St. Andrews district of Panama City, Florida. The marina was right on our doorstep and we were surrounded by bars, restaurants and cute little shops. It doesn’t get any better than this, does it? We had a great day walking around Panama City, followed by pizza and beer and then snuggled up in Scamper for the night. Sounds good doesn’t it? I mean, views like this at sunset at the marina – just spectacular. But here’s the reality of boondocking in this particular place. Yep, that’s right, we’re parked right next to some dumpsters. And what happens when you’re parked next to a dumpster? People chuck bottles in it at all hours. Nothing sweeter than hearing the sound of bottles breaking all night long. And then there are the folks that pull into the parking lot playing loud music with some sort of annoying thumping bass line. And why set an alarm clock, when you can get woken up by the garbage trucks emptying the dumpsters? But hey, it was free. And free is good, isn’t it? It's time for another one of our "Life Lately" posts. Just some bits and bobs about what we've been up to since we headed out of Texas and made our way along the seaboard to Florida. So here's what's been going on for us lately. One of the things I'm loving about our road trip is seeing new parts of the country. We had such an interesting drive from Texas to Louisiana - such interesting scenery and sights along the way. Our original plan was to head straight to New Orleans in search of beignets, gumbo and jazz. But then Scott had a great idea to spend a few days at Grande Isle, a barrier island south of New Orleans. Unfortunately, the weather sucked, but fortunately, we found shrimp which helped improve our mood immensely. We finally made it to New Orleans and had a great time. We stayed at a really dodgy RV park in the city, ate some mediocre Ethiopian food, had way too many beignets and enjoyed the sights. One major drawback of New Orleans - a complete lack of public toilets. If you're middle aged too, you can probably relate. 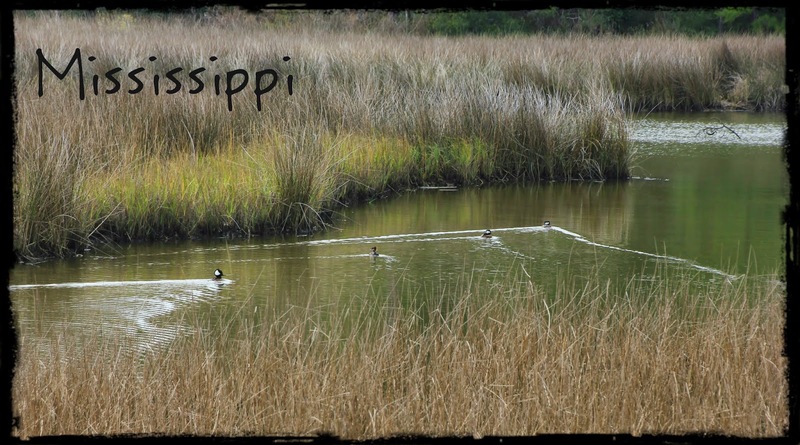 After New Orleans, we headed down to the Gulf Islands National Seashore in Mississippi. We had hoped to stay at the Davis Bayou campground but it was chock-a-block. The campground host and the volunteer ladies in the visitor center were really helpful and tried their best to help us get a spot, but no luck. So we spent the night at the nearby Shepherd State Park. We tried again the next day to get a spot at Davis Bayou, struck out again and spent the next night boondocking at Walmart. I love free camping! We're keeping track of how much we spend on our campsites and I have an Excel spreadsheet set up which calculates our average daily rate. Our stays at Walmart sure help to bring this figure down. One of the guys we spoke to at Davis Bayou in Mississippi suggested that we check out the Florida unit of the Gulf Islands National Seashore. I'm so glad that we took him up on his suggestions. Not only was there room at the Ft Pickens campground, the place is gorgeous. We've enjoyed walks on the beach, learning about the history of the fort and having some great barbeques. Scott also managed to hook in with the local racing scene in nearby Pensacola and got out on a boat one day. We also spent an afternoon checking out Pensacola. Such a great little town. And you have to love the fact that you can hear taps and reveille being played at the Naval base across the way from the campground. So that's what's been going on with us lately. What's been happening in your neck of the woods? Sign outside one of the few public toilets in New Orleans. Seriously New Orleans - what's with the lack of public toilets? Don't you know that there are middle-aged folks walking the streets of New Orleans desperately looking for a toilet? Or parents with little children who suddenly announce that they have to go pee now? Don't get me wrong New Orleans, you're a fun city to explore, but would it hurt to build a few more public toilets? Have any of you been to New Orleans? I was there many years ago with my mom and I don't remember being so desperate to find a toilet. But then again, I wasn't middle aged back then. If you're going to go to New Orleans, my advice is to do some planning before you visit. And I don't mean deciding what sights you're going to see or how many beignets you're going to eat at Cafe du Monde. I mean, figuring out where the public toilets are and marking them down on your map. Of course, you can always pop into a restaurant, bar or hotel and ask if you can use their toilets, but you do risk getting turned away. Trust me, it happens. But to be fair to New Orleans, despite the lack of public toilets, it is an incredible city. My mom and I visited before Hurricane Katrina and I was surprised how much the city looks the same. I'm not sure if they just did a fantastic job rebuilding or if I just can't remember things anymore. I'm middle-aged, remember. Memory is one of the first things to go. Anyway, here are some pictures of our time in New Orleans so that you know that it wasn't all bad. At some point, I'll do one of our "Going for a Walk" posts so that you can get the full scoop on what we got up to when we weren't looking for a bathroom. By the way, if you want to see our other "Going for a Walk" posts, just click on "Walk" under labels on the right hand side of the page. They're mostly pictures with some eccentric humor thrown in from time to time. One of the musicians outside of Cafe du Monde. I love their beignets and cafe au lait so much that we went to Cafe du Monde two days in a row! And if you're desperate for a toilet, there is a public one near Cafe du Monde. But it only seems to be open during the day. I made the mistake of trying to use it at night. One of the many old ghost signs on the buildings in New Orleans. Mint juleps are delicious. Only problem is that if you drink too many of them, you'll be desperate for a toilet. Picture at the Basin Street Station. You can find tourist information, some exhibits and public toilets there. 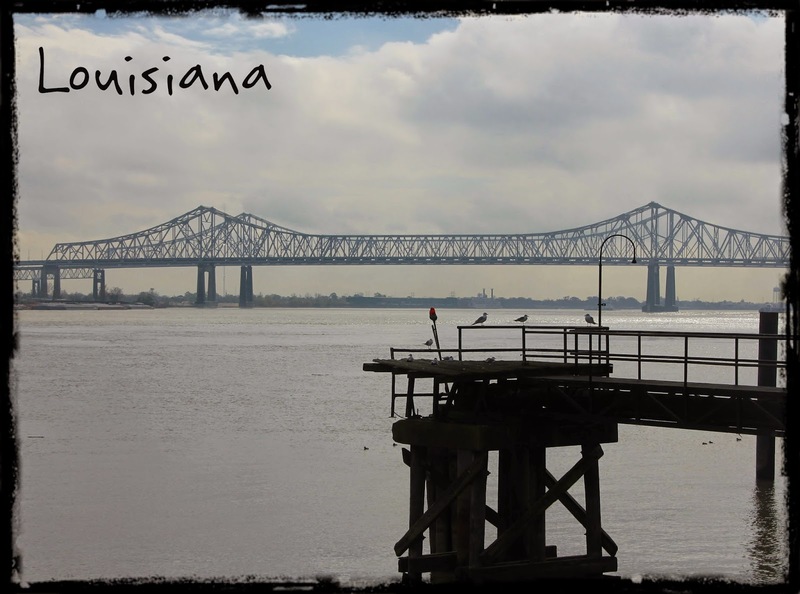 We explored New Orleans and searched out public toilets on 10-12 January 2015. 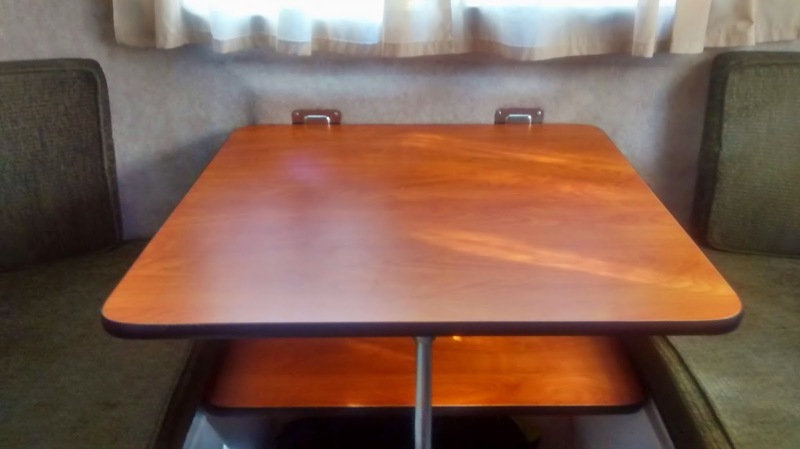 As a result of our post on our initial thoughts about living in our 13' Scamp travel trailer full-time, we've had some requests to see what she looks like up close. I imagine that's because most people think it's pretty darn crazy that two people are living in a 65 square feet travel trailer and they want to see pictures of our tiny house on wheels just to see how insane we really are! So here you go - let's take a tour so that you can meet our little Scamper. We'll start off with a description of the layout and options we chose. If you're not the market for a Scamp or Scamp fanatic, then you may find it boring. In that case, feel free to scroll down to see the pictures. Originally, we looked for a used Scamp, but it proved impossible to find one, especially with all of the options that we wanted. Scamp seems to have a cult like following and it really is a seller's market. A Scamp will come on the market one day and be sold by the next. So, in the end, we decided to buy new. That enabled us to get the options that we wanted. But because we wanted a Scamp in a hurry, we ended up getting one that had been partially built, which meant that we got some options we wouldn't necessarily have chosen, but were glad we got in the end. 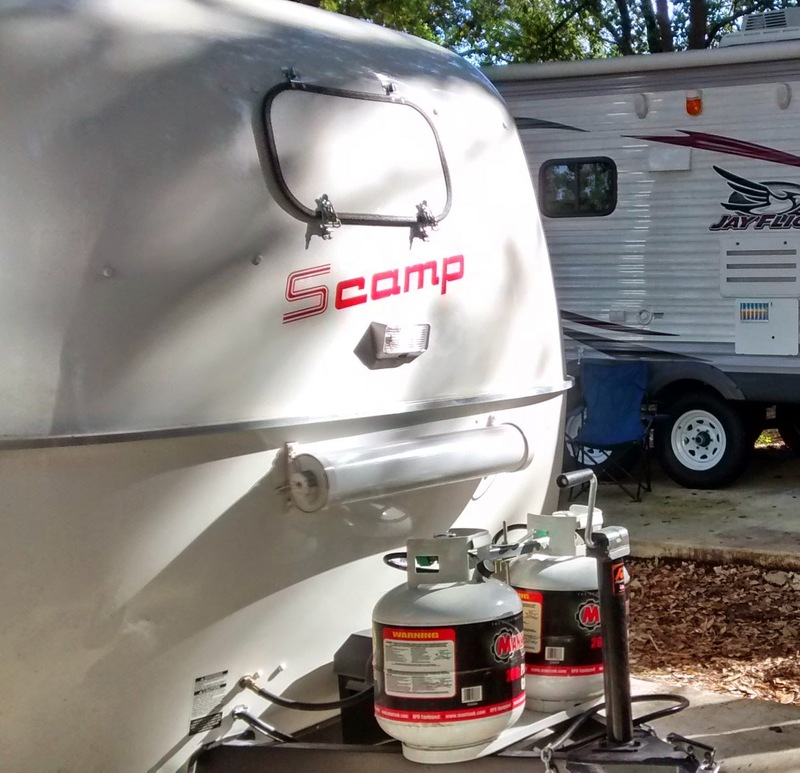 There are three sizes of Scamp travel trailers - 13', 16' and 19'. We're limited by how much we can tow with our Nissan Pathfinder, so we went with the 13'. When they say 13', that's measured from the end of the tongue to the rear bumper. That means that the length inside is actually less than 13' - more like 10'. The width inside is around 6'5", which gives you a whopping 65 square feet of living space. With the standard 13' Scamp, you have two layout options. One with bunk beds and one with a shower/toilet combo and cupboards at the front. Come back on Wednesday to read our post about being desperate for a toilet in New Orleans, then you'll know that having a toilet is a pretty important thing for middle aged folks like us! Both options have a kitchen area to the left hand side and a cupboards to the right hand side near the door. The back of the Scamp is where the dinette is located. It cunningly converts into a bed at night. Or stays up as a bed all day and night if you're feeling lazy. There are two sizes of beds available - the standard one (46") and a wider one (54"). The Scamp we ordered had already been configured for the wider bed, so that's what we got. And I'm so glad that we did! We both can fit comfortably on the bed. I can't even begin to imagine how cramped it would be in the smaller one. There is a more expensive deluxe wood version of the 13' Scamp available, but we're not really deluxe people, so we went with standard. You can see pictures of all of the layout options on the Scamp website here. The one option we didn't get, which we regret, was a 12 volt charger. Scott will install one at some point. Here's what she looks like on the outside. 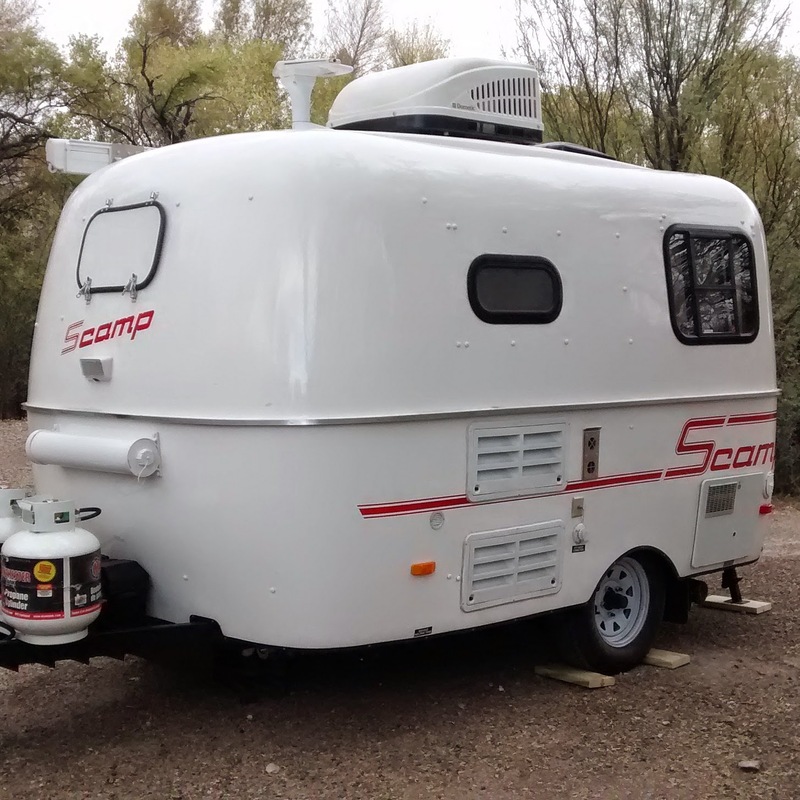 Scamp travel trailers have a hard shell made out of fiberglass. They make the shell in two molds - one for the top part and one for the bottom - and then attach the two together in the middle. You can see the metal belly band in the photo below where the two pieces are joined. 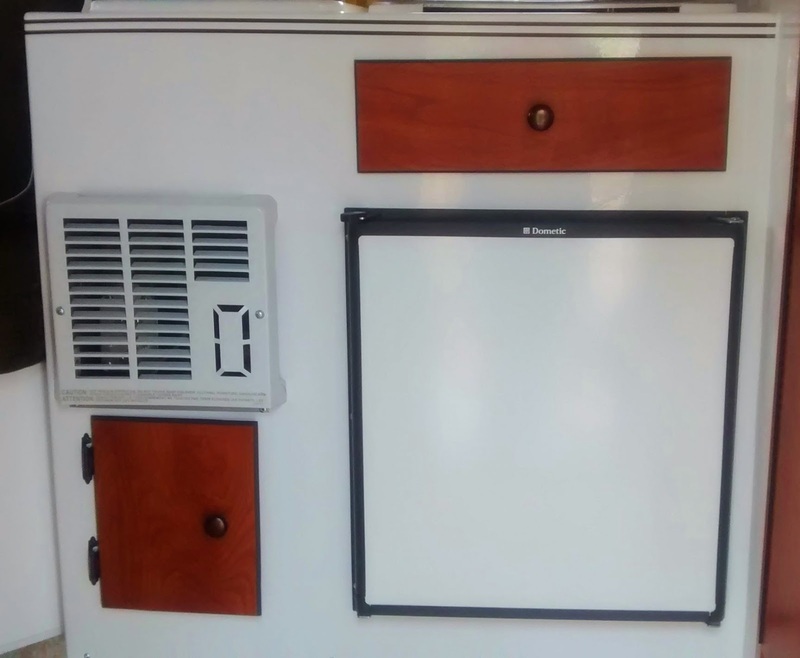 You can also see our A/C unit and TV antenna on top, as well as our awning. Here's what Scamper's two propane tanks look like. The tube over the propane tanks is where our sewer hose is stored (you know the icky thing you connect to empty your grey and black water tanks). A 10' hose comes standard. Turns out 10' sometimes isn't long enough. So we bought a 20' hose which won't fit inside the tube. We'll need to figure out another solution. You can also see the gravel shield which protects the front window from damage while being towed. Underneath the gravel shield is the optional front porch light. 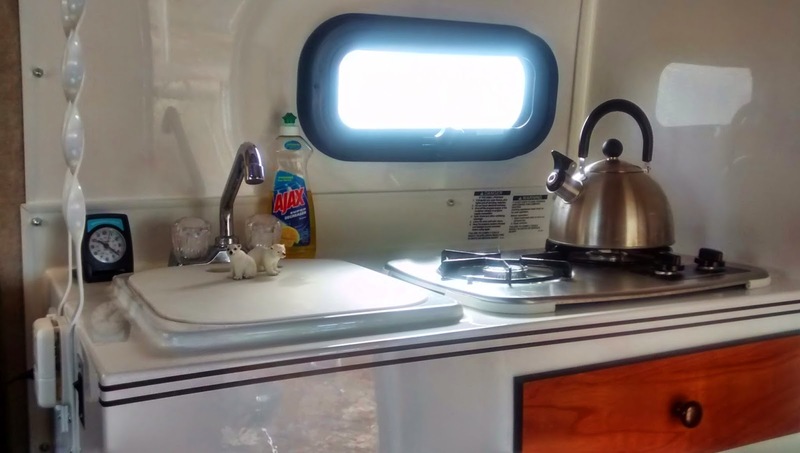 We have six windows on our Scamper - two on each side by the dinette, a larger one at the rear, two smaller ones over the stove and in the bathroom, and one in the door. We also get light in through the hatch for the fan on the roof. In this picture, you can see the panels for the various systems. The bottom larger white one is how you access the fridge controls so that you can choose whether you want to power it with propane, run it off of the battery or through shore power (i.e., being plugged in). The small metal panel to the right of the upper which panel is for the furnace ventilation. Below that are the cable hook-up and where you connect a hose so that you can tap into city water. To the far right is the panel where you access the hot water heater. Scamper's umbilical cord (aka her electric plug) is to the right of the hot water heater panel. It is a 25' long cord - I wish it was longer. But that's probably a story for another day. The connections for the black and grey water tanks are underneath Scamper - black on the left and grey on the right. On the back of Scamper is where you fill the fresh water tank. You can also see the silverware drawer below the stove and these strange brown racing stripes that I think are supposed to be decorative. If we had known about the stripes, we would have asked them not to put them on. To the left of the sink on the side, you can just make out the thermostat for the furnace, the 120 volt outlet and the water pump switch. Underneath the stove and sink are our furnace and fridge, plus a tiny little cupboard which has a 120 volt outlet in it which the fridge is plugged into. Not much room for much else. Most folks would think our fridge is tiny (1.9 cubic feet), but it's plenty big enough for us. Sometimes, we use our ice cooler for extra cold storage - like for that all important beer. Above the stove and sink are two cabinets which we use to store our dishes and pots and pans. When you live in a tiny house on wheels, you only have room for a few things so we just have one pot, one frying pan and enough dishes and glasses for two people. If you get a dinner invitation from us, can you bring you own plates? To the rear of Scamper is our dinette/bed area. Here's what it looks like with the table set up. The table folds down at night and lays on a groove on each side of the dinette seats. Because we have the wider bed, we have an extra board which slots into the grooves next to the table. During the day, there really isn't any good place to store this extra board. We've been putting it the grooves under the table and using it to store our bedding on. The only problem is that you lose some space underneath the table for your legs. For the Scamps with the standard bed, I think they have a longer table which is the sole support for the bed. So, they don't have an extra board to worry about during the day, but then they're more cramped at night. 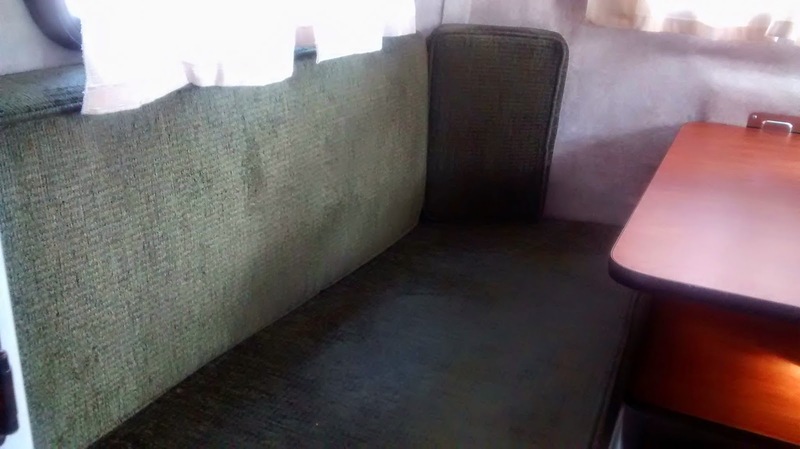 The dinette seats have two cushions each - one on the bottom and one on the back. The back cushions get placed on the table and extra board at night to make up the "mattress" for your bed. In terms of storage space, we have two side cabinets above the dinette. We also wanted a rear cabinet, but because we got A/C, there wasn't room for it. You're only supposed to store lighter items in the upper cabinets as they don't have the support that some of the other cabinets have. You can see the optional reading lights that we got attached to the bottom this cabinet. They swivel all around so you can direct the light where you want it. We also have cabinets next to the outside door. We use one of the cabinets as a pantry and one to store miscellaneous stuff like cleaning supplies. There's a fire extinguisher mounted on the side of cabinets and a CO2 detector below them. Again with the racing stripes. What were they thinking? Here's what the door looks like from the inside. It has a pin so that you can lock yourself in at night. You can also see the curtains that come standard. Pretty bland. If I had a sewing machine, it might be something I would change. 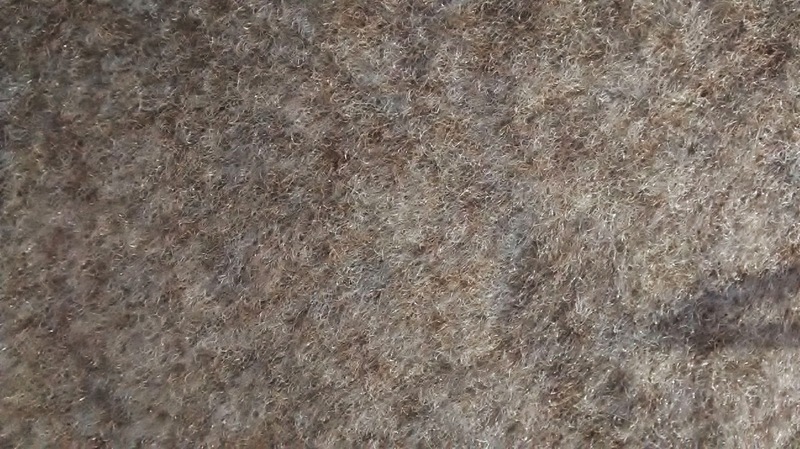 Have you noticed that furry stuff covering the walls? It is known as "rat fur" - I kid you not. I believe it is supposed to have some magical insulating properties, but to be honest, sometimes I feel like I'm living inside of some sort of furry animal. Here's a close-up of what it looks like. I can't even begin to imagine how you keep it clean. And here is the door to the all important toilet and shower room. You'll notice more cupboards next to it. We store our clothes in these ones. And finally, what you'll all been waiting for, pictures of the bathroom. 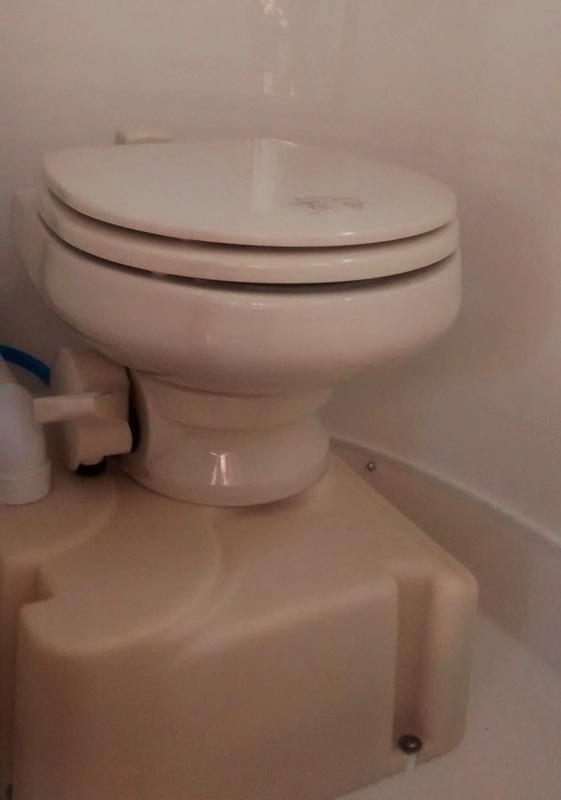 We have your basic marine type of toilet sitting on a 9 gallon black water tank. (FYI - our grey water tank is 26 gallons and our fresh water tank is 12 gallons.) The shower is opposite of the toilet. While there isn't a huge amount of room in the bathroom, it is bigger than you might think. And when you're not using it as a bathroom, you can always use it for extra storage. And that's the tour of Scamper, our tiny house on wheels. As someone said, "it's so tiny, you have to go outside to change your mind." Sure, she's small, but she's all ours and she takes good care of us. Our original plan after leaving Texas was to head straight to New Orleans. But then Scott had a brilliant idea. He actually has lots of brilliant ideas, but don't tell him I said that. It might go to his head. We wouldn't want that, would we? Instead of heading eastwards to New Orleans, Scott suggested that we head south on LA 1 to Grande Isle. Grand Isle is a barrier island in the Gulf of Mexico about 100 miles south of New Orleans. Such an interesting drive along the canal looking at all of the fishing boats. Eventually, you have to cross a toll bridge to get to Grande Isle. If you have three axles, it will cost you $4.50 southbound (no charge going back north). Who knew that I would start to count how many axles we have? Fortunately, Scamper only has one axle - larger RVs pay more. Yet another reason why smaller is better. Except when it comes to chocolate ice cream. Then, of course, two scoops are better than one. It was another nice day driving down and we were full of hope that we would be able to enjoy some outside time on the island. We got ourselves a spot at the Grande Isle State Park ($20 a night for a large pull through site with electricity and water, free laundry and your own personal palm tree) and checked things out. Of course, it wasn't long after this that the winds picked up and the clouds came rolling in. So we ended up spending most of our time snuggled up indoors Scamper seeing how long we could stay cooped up inside of a 65 sq ft camper before one of us snapped. It was touch and go for a while. But, then we discovered shrimp. Not just any shrimp, but shrimp from a place called Dean's. We would have never have known about it, if we hadn't chatted with some locals. Possibly one of the best local tips we've ever had - $4 a pound for shrimp caught that morning. Just look at these beauties all ready to be cooked. Delicious. They almost made us forget about the crappy weather. We also had some wine with our dinner. That might have helped too. The next day, we thought about heading off to New Orleans, but the forecast still didn't look great. So we stayed another night. Of course, we got more shrimp. And more wine. Scott made the most amazing shrimp pasta dish with a spicy red sauce. It is amazing how effective shrimp, wine and a couple of episodes of Deadwood can be in distracting you from the weather. To be fair, we did do a few excursions and explored the area. Mostly in conjunction with procuring shrimp and wine. We checked out the cemeteries, the old houses and walked along the beach. Yet another place we've come across in our travels that would be so awesome on a warm sunny day. 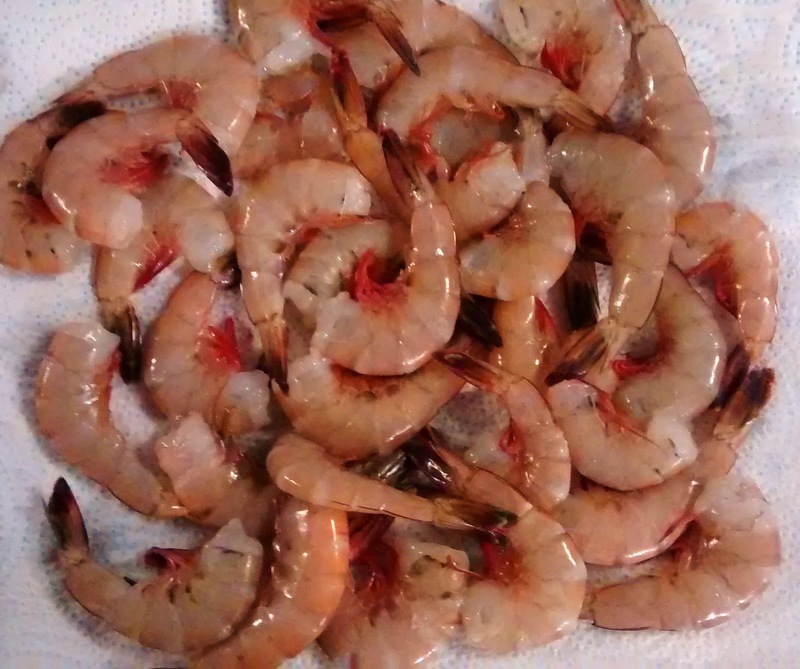 What's your favorite shrimp recipe? How do you keep from going stir crazy when you're stuck indoors? We snuggled up with shrimp at Grand Isle State Park on 7-9 January 2015.